Connor has a long list of television series, film and theater work on his resume, but it’s his role as the pop pitchman that’s led to his widest recognition. Before Larry, Connor — usually billed as James Michael Connor or James M. Connor — was more likely to be recognized for a 2000 two-episode role as a despicable scientist on Buffy the Vampire Slayer, for a 2001 Holiday Inn spot, or for appearing as the best man in a wedding scene in About Schmidt (2002), directed by friend and fellow Creighton Prep alumnus Alexander Payne. With a filmography including widely recognized movies and series like Parks and Recreation, Scrubs, X-Files, Blades of Glory and Watchmen over several decades, Connor said when he’s not in Larry costume that people tend to find him familiar but can’t quite place him. “Depending on their age, they think they went to school with me or I was their high-school guidance counselor,” he said. At an age when leading-man types’ careers begin to wind down, the 56-year-old Connor is getting more work than ever. 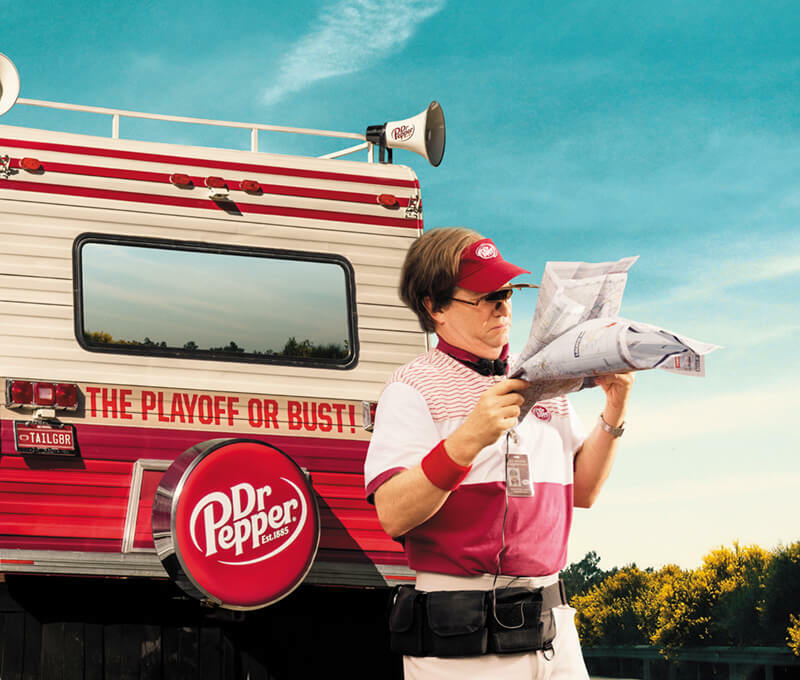 He credits past improv training with helping him land the Larry Culpepper role and its associated public appearances, and said those skills are also now being embraced in some of his more recent parts. Connor, the youngest in a family of seven kids, said he “loved attention and being entertaining; a lot of actors are the youngest.” But he originally envisioned weightier roles. He also joined an improv troupe at Creighton Prep, where he discovered that he was fast on his feet. He graduated from Prep in 1978 with a modified dream that incorporated his obvious gift for comedy. “I guess what I wanted to do out of high school is move to L.A. and revolutionize the sitcom industry. I wanted to write, I wanted to act, I wanted to do all that stuff,” he said. Instead, he went on to earn a bachelor’s degree in theater from Saint John’s University in Minnesota, where he “got into the theater department there and kind of found my place, my calling.” He spent several post-college years in Boston where he worked as a carpenter while pursuing work in theater and short films and earned his SAG, AFTRA and Actor’s Equity union cards. He also did some improv work. Then it was on to grad school at the National Theatre Conservatory in Denver followed by a two-year stint with the Denver Center Theatre Company. In 1992, he moved to Los Angeles for TV and film opportunities. To date, he’s also starred in more than 150 TV commercials. “I think what I’m doing now is what I wanted to do at the beginning. When you’re doing improv you’re sort of writing as you’re acting. You’re definitely making the words your own … it’s more exciting. When you can do it well, the writers appreciate it,” he said. Connor said the role he has liked least was a six-week stint on a soap opera called Passions, where he played a creepy henchman/sexual assailant. “That’s a really weird universe to work in.” His favorite role so far was one of his most recent and also one that gave him ample room to improvise: dramatic arts teacher Martin Seychulles on HBO’s dark comedy Vice Principals. “That was a lot of fun,” Connor said, adding that episodes are continuing into 2017. Connor said although he worries about possible eventual overexposure in the Larry Culpepper role, he’s enjoying the newfound recognition. And he remains solidly down-to-earth, especially at home. His 8-year-old son, Lars (with wife and former agent Brooke Nuttall), isn’t exactly awestruck with seeing his dad on TV. “He likes it, but it’s just normal to him,” Connor explained. His 22-year-old son Liam gets an occasional “Your dad is Larry Culpepper? Oh, my God!” Connor added, but isn’t particularly impressed, having grown up as the child of two actors. Both sons show creative talent, but Connor said he doesn’t anticipate launching the next Hollywood acting dynasty. In fact, he’s more interested in a different kind of legacy: his production company, UW Productions. “UW for Union Working. We’re doing pro-union PSAs because there’s a lot of non-union work that’s sort of destroying the commercial industry. So we’re trying to get the message out there that unions are good for the better actors and you have to support them in a class,” he said. Connor still maintains ties to Omaha and visits family here. He’s also part of a group of Creighton Prep alumni who work in the entertainment industry and said he enjoys his meetups with “Hollywood Prep” several times a year.